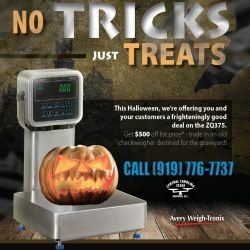 This Halloween, Avery Weigh-Tronix and Central Carolina Scale are offering you a frighteningly good deal on the Avery Weigh-Tronix ZQ375 over/under checkweigher scale! Get $500 off the Manufacturers Suggested List Price when you trade in any old check weigher! So, how do you get the $500 trade in discount? To get your hands on this spooktacular deal, place your order with us for selected ZQ375 checkweigher scales and send us the old trade-in checkweigher(s) when you make the purchase. The old trade in checkweigher scale must clearly show the make, model and serial number in order to qualify. Which models are included in the promo?